on a tablet loaned to them by the venue without necessarily needing to be online [heritage sites are sometimes characterised by having thick walls and are wifi-challenged]. We have neither the expertise nor the desire to implement native apps, both because of the costs of maintaining apps across multiple platforms and because of visitors’ resistance to loading apps. We have also had a bad experience using someone else’s app which was removed without warning [Everytrail] so we are looking at implementing webapps. 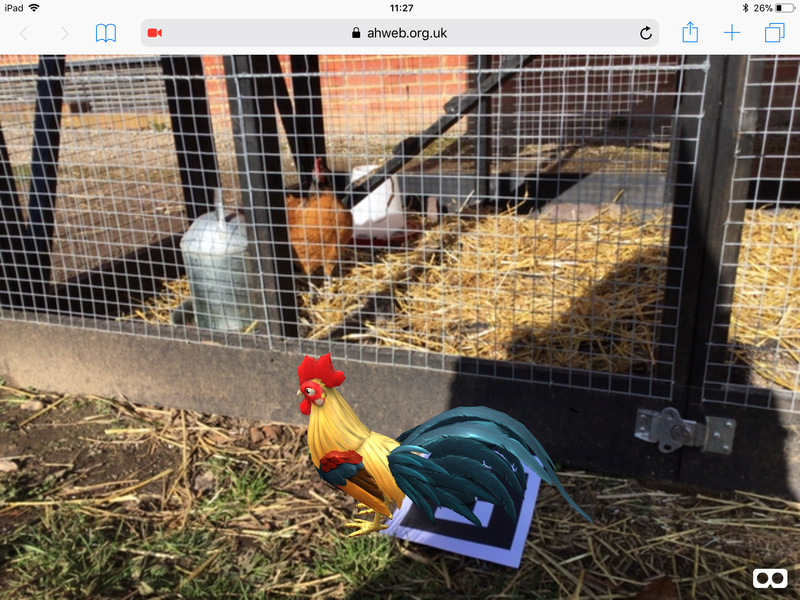 Our first experiment is with an iPad running IOS11, Jerome Etienne’s ar.js tracking suite on top of ARToolkit and a couple of models downloaded from Sketchfab. Here they are in the Museum of English Rural Life (Reading, UK). Visiting the ladies in the chook run Cockerel model CC attribution The Ice Wolves (https://sketchfab.com/sarath.irn) So what is cow reality? White-brown cow model CC attribution Josue Boisvert ‘Real’ black-white cow model by MERL. There are some problems with using iPad. also does not work in the Kiosk Pro app. Such problems don’t exist on a 6 year old laptop running Windows 7 for example so it was disappointing to find that the iPad felt less usable. All this may mean we have to abandon thoughts of using the iPad for anything other than visitors bringing their own and in sites with good wifi, unless we can tie things down using guided access. In other experiments, the Kiosk Pro app has enabled us to load all the code into the iPad, lock it down sufficiently so that the visitor cannot ‘break out’ into another activity, and safely allow them to use the activity without supervision/having to constantly check that nothing has stopped working. [See for example the Ladybird book which formed part of an exhibition some years ago and needed no supervision] We hope that Apple will lift these restrictions. We will now experiment with Android devices.